since the small give beetle and wax moth invasions, I’ve been keeping an eye on my give, but mostly leaving them alone. I did one inspection a couple of weeks ago, and it looked like they were hanging in there, but we’re still dwindling in number. There hasn’t been much activity coming in and out of the hive, either. That is, a small amount of forager traffic, but not nearly the amount there usually is. Yesterday, I decided to do another inspection to see where they’re at. I’ve been worried that they were queenless and dying off by attrition. I opened up the hive and found that, of the 16 or so frames that they had built out, they had scaled back to using only 5 or 6. The others appeared to be abandoned, brood (in some cases) and all. In fact, a couple of frames had dead bees half-emerged from their cells. It was a sad sight, for sure. The frames that the bees were still on appeared to be bustling with activity. I didn’t notice the queen, but I did see uncapped larvae, so I’m pretty sure she’s still in there. That’s a big relief. The comb they’re still using appears to be a mix of lots of pollen and brood, and basically zero stored nectar. I don’t think I saw any honey/nectar stores. I’m think what’s happening is that they didn’t get enough stored up before the mid-summer dearth (which I think we’re in right now), and are now struggling to stay afloat with the paltry forage available in the area. I’ve gone ahead and put a top feeder on to try to supplement them. They haven’t found it yet, but it usually takes them a couple of days. I’m hoping that will be enough to ride them over. After putting the feeder on, I closed the entrance down to just an inch and a half wide. Their numbers are so low, I don’t think they could fight off any robbers coming to get into the feeder, so hopefully this helps. I also am going to need to move the hive. I’ve mentioned before that the spot they’re in gets basically zero morning sun. They’re usually out and about fairly early, but I’m wondering if the lack of morning sun caused them to get a late start every day, and miss out on extra nectar. I’ve got a spot in my yard that gets great morning sun, but a shed is there right now; one that I’m not looking forward to moving. Still, it’s going to have to get done. It’s a better spot for the bees all around. SOOOOO, as I’ve mentioned, I built my own hive. It’s a long Langstroth-style hive. Kind of a cross between a top-bar hive and a Langstroth, in that it’s a single box that holds 32 medium Langstroth frames (actually, I think they’re properly referred to as “Hoffman” frames). One of the “features” I added was a screened bottom to help with mite control, and a cover below that to limit the otherwise-huge amount of ventilation the hive would receive. 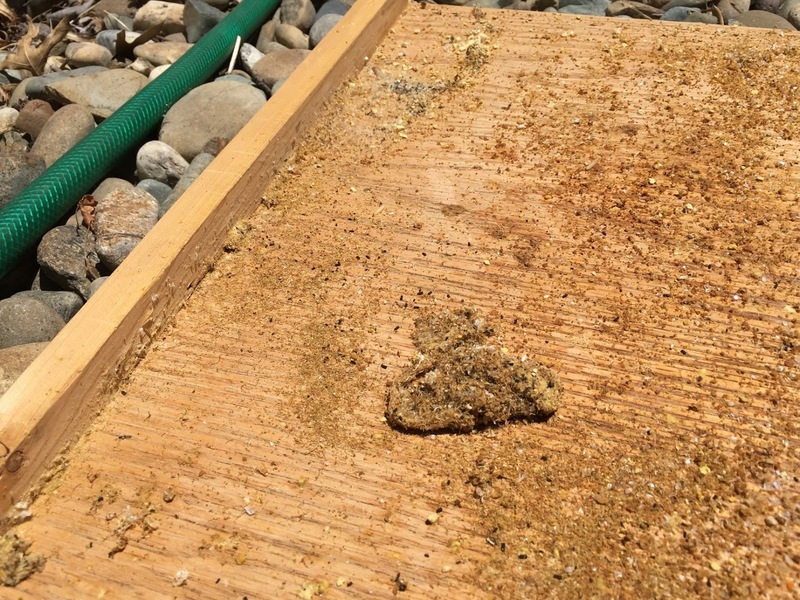 What I didn’t think of at the time, was the fact that this provided about 1″ of space inaccessible to the bees, but easily-accessible to pests like wax moths and small hive beetles. I realized this a month or so ago, but figured I had some time to deal with it, as I hadn’t noticed any signs of infestation as of my last inspection a couple of weeks ago. Well, when I got back from a vacation Tuesday, I did an inspection, and saw a small hive beetle running across one of the frames. Weeeell… great. I finished up most of my inspection (though, stupidly, because the bees were getting agitated, I didn’t check the last couple of frames, which are the oldest, most-established frames, and, in hindsight, the most likely to have wax moths/SHB in them), and closed up the hive. Having a pretty good idea of what I’d find, I slid out the bottom cover and had my fears confirmed. The ball in the top photo is a mix of wax moth webbing and hive scraps (pollen and wax, mostly). 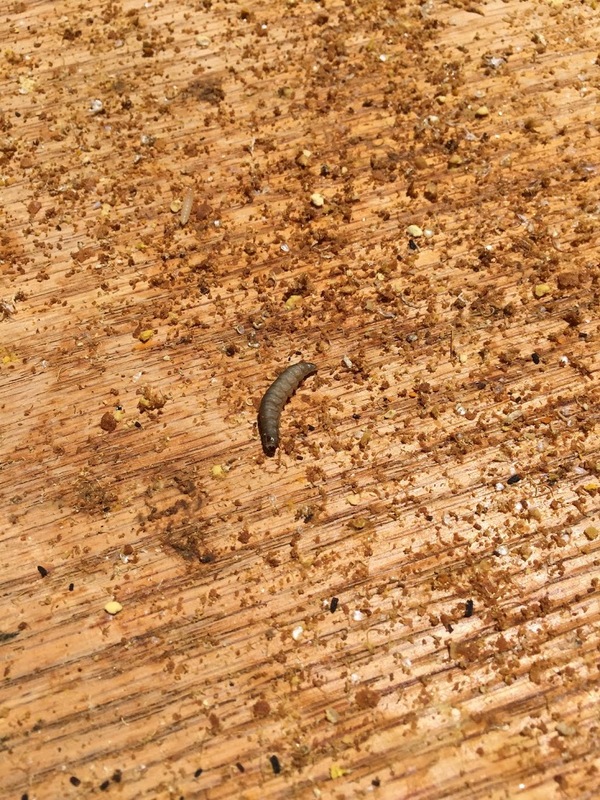 The bottom photo shows a large wax moth larva, and I’m pretty sure the smaller larvae are small hive beetle larvae. I pulled the tray out and left it in the sun, which killed the larvae after only a few minutes. It would appear that they’re not well-equipped to handle the heat of direct sunlight, especially in California during the summer. I scraped off the cover and set it aside, knowing that I can’t really use it anymore, or this will just happen all over again (because of the space it provides for pests to hide, not because it’s “infected” or anything like that). To fill the space, I measured the bottom of the hive, and cut a board to fit up against the bottom screen. Unfortunately, I didn’t have a good way to secure it in place, so I had to improvise. 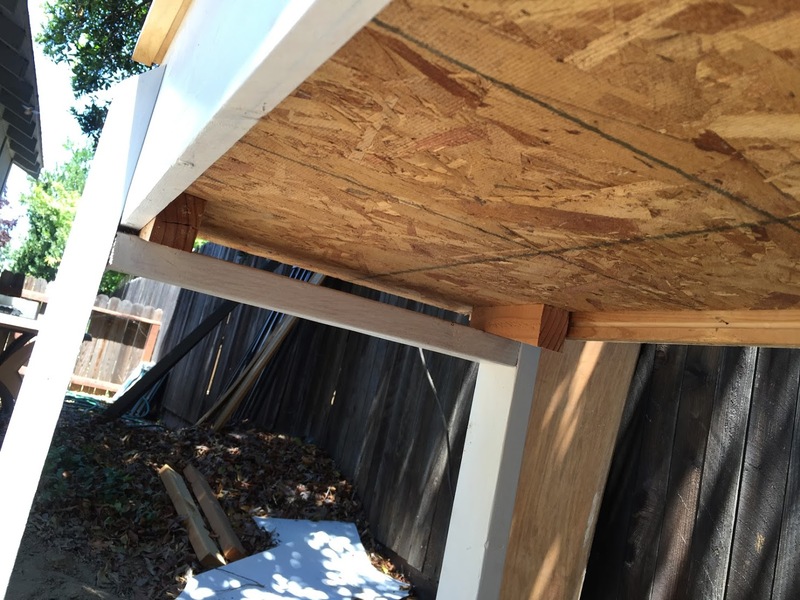 Part of the hive design is a cross-beam at the front and back, to provide some support. In this case, those supports provided a decent way to hold up the board. I cut wedges from a couple of 2×4’s, slid the board into place, and tapped the wedges between the cross beams and shiny new bottom board. It still leaves a very small gap at the edges of the new bottom board, due to some cutting inaccuracy on my part, but it should be less than 1/16″, so I’m not too worried about it. So, I think everything is okay for now. Probably. What really surprised me was just how fast the hive went from “nothing wrong” to “oh god, the wax moths have a whole little nest set up”. It really caught me off-guard. I was planning on doing a split when I got home, but they’re definitely not ready. They still have pretty limited stores, and no capped honey that I could see. Whether that’s because they’ve been busy trying to deal with invaders or not, I don’t know. I’m not planning on doing much else to deal with moths/beetles, because I feel like treating for pests just breeds weaker bees and more resilient pests. If my bees die, they die. I think they’re going to be okay for now, though. I think I’m going to do a quick inspection this weekend, to check out those last two frames and make sure they’re okay. If they’re infested, I’ll probably pull those frames out. I don’t think treating for pests is a great idea, but in this case, it’s mostly my fault that they got infested. I stacked the deck in favor of the moths and beetles, so I suppose I can help even things out a little bit. Drone brood and queen cups! Hive inspection yesterday. Still lots and lots of brood (so much brood. I love it! ), including at least one frame of nothing but capped drone cells. On a couple of frames, I noticed some odd cells that I later learned are queen cups; possible predecessors to queen cells. These don’t necessarily mean anything, as bees often build and tear then down “just in case”. Still, I think it suggests that they’re doing well. I’m not going to be able to inspect again for a couple of weeks, but when I do, I’m planning on doing a split then. Must… make… more… bees. Anyhow, everything seems to be going well. Some minor cross comb issues where I put in new empty frames last time. I also went ahead and added some more empties for good measure, though. I’m sorry it’s been so long! There just hasn’t been much going on in the hive. I think I mentioned that I expanded their nest a bit, icing them another 6-8 frames to build out. They haven’t seemed to care much, though. They had built a little comb on one of the new frames, but the others remained untouched, so I stuck a couple between the drawn out frames at the edge of the brood nest. So far, that seems to have had the desired effect. I’ve also figured out a way to fit a Mann Lake top feeder on the hive (the middle support board was too close to the edge). It took a few days, but they’re finally taking the feed. Mostly, I just want them to build out as much comb as possible. Once they’ve got the hive mostly built out, I’m going to try a split, I think. That’ll be about 16 frames for each. 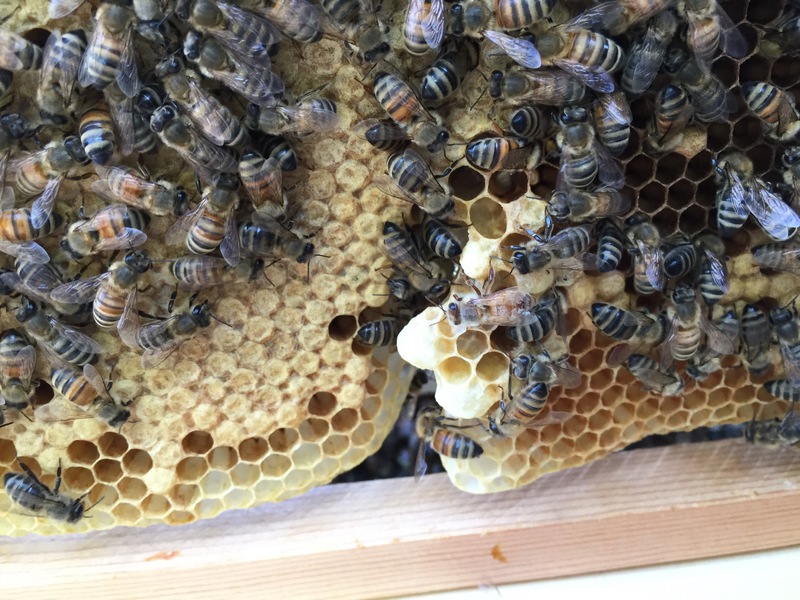 The queen is still laying like a champ (or was a week ago when I opened the hive last). they’re building up that workforce quick. Anyhow, here’s some more slow-mo bees. Because why not? So, one piece of advice I see a lot is that the earlier your hive entrance gets direct sunlight, the earlier your bees will get out and start foraging. This was one of my concerns with the location I chose for the hive; it’s fairly shady, and doesn’t get direct sunlight until the late morning. Even then, I’ve got the hive entrance facing South (toward an even shadier spot). I can happily report that my bees do not seem to give two squirts of nectar about when the sun starts hitting the hive. I don’t check them every morning, but when I do, it’s usually around 7:00 or 7:30, the hive is still in full shade, and they are zipping in and out of the hive like a busy airport. Now, whether they’d be better-off in a sunnier spot… Maybe! They seem pretty happy with where they are now, though. I might actually move them back behind the pool house, and turn the hive around. I’ll need to move a pile of dirt and rocks to do so, but it will give more space for the pond I want to build by the hive. I opened up my hive yesterday to check on their cross-combing, and it looks like it’s under control. No comb between frames at the moment, and no comb even stretching toward any adjacent frames. It does, however, look like they’re still kind of building around the comb that I hung back in place with rubber bands. My first guess was that I hung it upside-down (comb cells have a downward slope built into them, to prevent nectar/pollen/babies from falling out), but it doesn’t look like that’s the case, so I’m not sure what’s going on. I thought about just cutting that part out, but they’re actually using it, so… shrug. I might cut the edges to encourage them to merge it with the rest of the comb on the frame. I have no idea if that’s a thing that will work, but I could see how it would (and how it wouldn’t. Who knows?). Unfortunately, I didn’t get any pictures this time. I need to come up with a good way to take photos. It’s a pain to set things down, pull out my phone, take pictures, etc. Whatever I come up with will probably involve a tripod and a voice-activated-camera app for my phone … or roping someone else into suiting up and coming out to take pictures during my inspections. I did, however, get another slow-motion video of the hive entrance the other day, so I’ll share that. I really want to add a “Ride of the Valkyries” soundtrack to it, but I think it’s okay on its own, too. Anyhow, I figured, “While I’ve got the hive open, I should do a full inspection”, so I went through each frame, checking brood patterns and looking for the queen. I did not manage to find the queen (imagine if Where’s Waldo had nothing but Waldos, and you were trying to find the one that was about 50% taller than the rest, wearing blue slacks instead of jeans), but there was capped brood everywhere. Wherever she is, she is an egg-laying machine (thanks, Noble Apiaries). There was a decent number of empty brood cells (so, larvae that had finished growing into adult bees and emerged from their capped cells, ready to work); probably 3/4 of a medium frame’s worth. Other than that, though, every other frame was probably 75% capped brood, with maybe 5% capped honey in the corners, and pollen, nectar, and fresh eggs rounding out the rest of the cells. The sheer amounts of brood is a good thing, but I’m a little worried that they aren’t going to have room for nectar/honey. 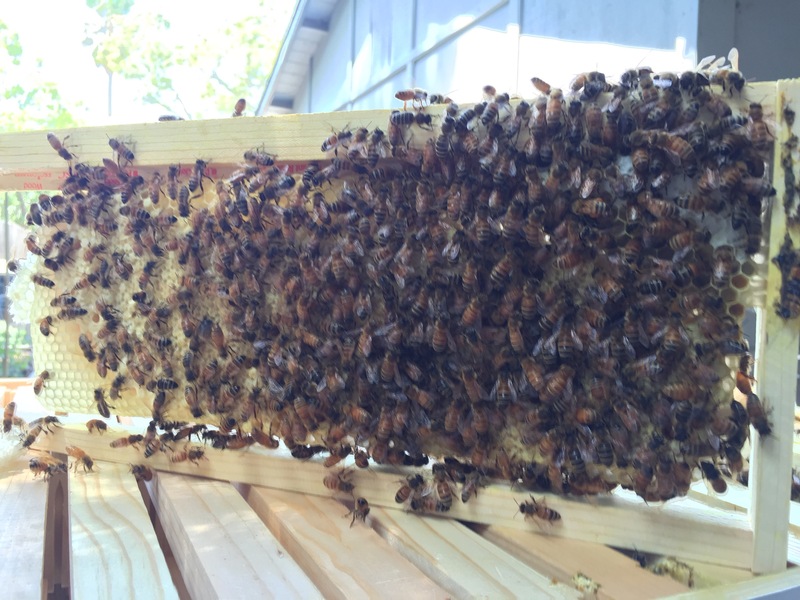 They’ve started building comb on one of the new frames I gave them, but not much, yet. The frame is maybe 10% built. I’m considering feeding them some more to encourage comb building, but I like the idea of letting them set their own pace, naturally, based on what’s available, forage-wise. Michael Bush is a big proponent of just staying out of your bees’ way and letting them do what they’re built to do. Makes sense to me. I opened the hive back up today to make sure their cross-combing was under control. Of course, it wasn’t. Though, it was better than last time. Today, I only had to work on three frames. I ended up taking out some fairly large portions of comb, most of which, again, fortunately, were nectar and pollen. I then pushed back into place the comb that was out of sorts with my hive tool. I think everything is fairly straight, now. We’ll see, though. Aside from the cross comb, the girls are doing a great job. There is a ton of capped brood in the hive, and a decent amount of capped honey and pollen. I’m considering putting the feeder back on, but I think they’re doing fine without it, and I’d rather they be foraging than getting too used to the feeder being there. 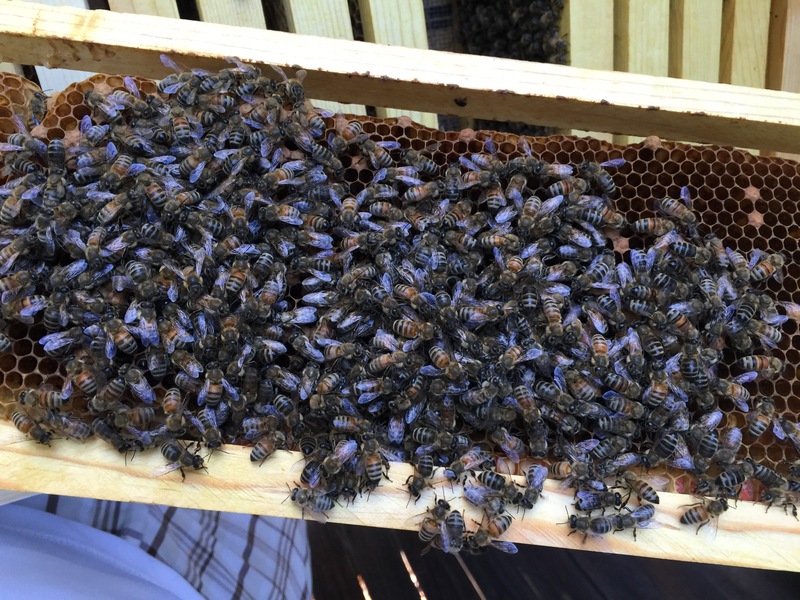 When I last had the hive open, I moved the follower board back, and gave them another 6-7 frames, as they had built out comb on all of their available frames already. They haven’t yet started building onto the new frames yet, but it’s only been a couple of days, so I’m not too concerned. One nice part about their having built out so much comb is that they’re not as densely clustered everywhere. It makes getting frames in and out, and checking the comb much easier. Jeez. Get it together, girls! a couple of days ago, I had an opportunity to open up the hive to see how my girls were doing. Unfortunately, the broken comb I had rubber banded back into two of the frames had given them a solid excuse to start some cross-combing. Four or five frames were all joined together by stray pieces of comb, each attaching one frame to the one next to it. I ended up doing some major surgery on the cross comb. Fortunately, most was just nectar/pollen, but I definitely opened up some brood in the process, which made me feel like a bum, but it seemed necessary. 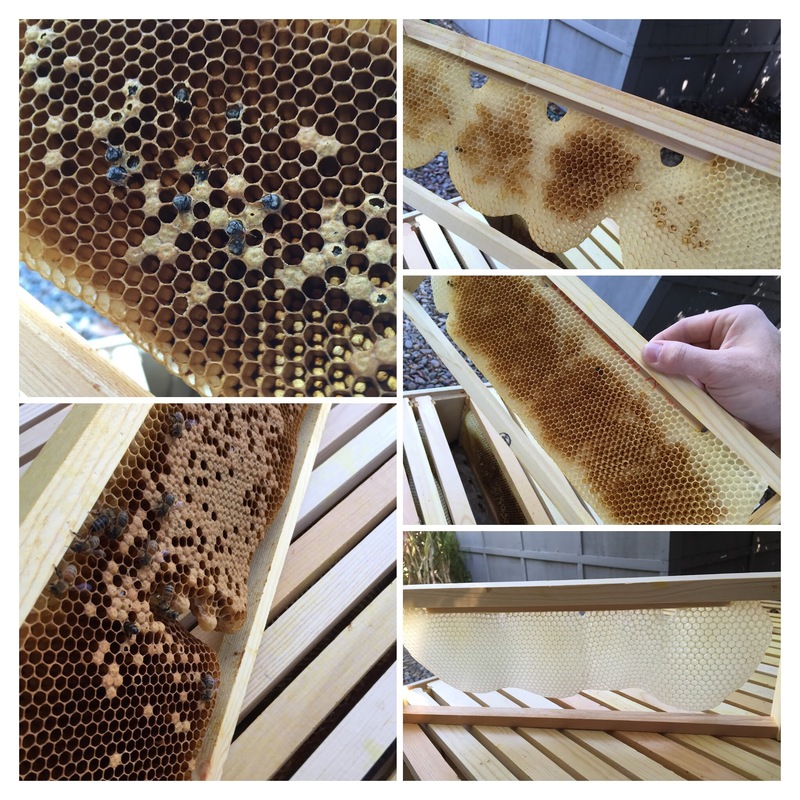 What I’ve learned: if you break some comb off in your new hive… Just leave it out. If I had left out some mostly-empty comb a couple of weeks ago, I wouldn’t be having to kill fairly mature brood now. I haven’t opened up the hive in a couple of weeks, thinking I’d give them some time to just… do their business without me screwing with them. They still seem like they’re going about their business, so I’m assuming things are relatively well in there. 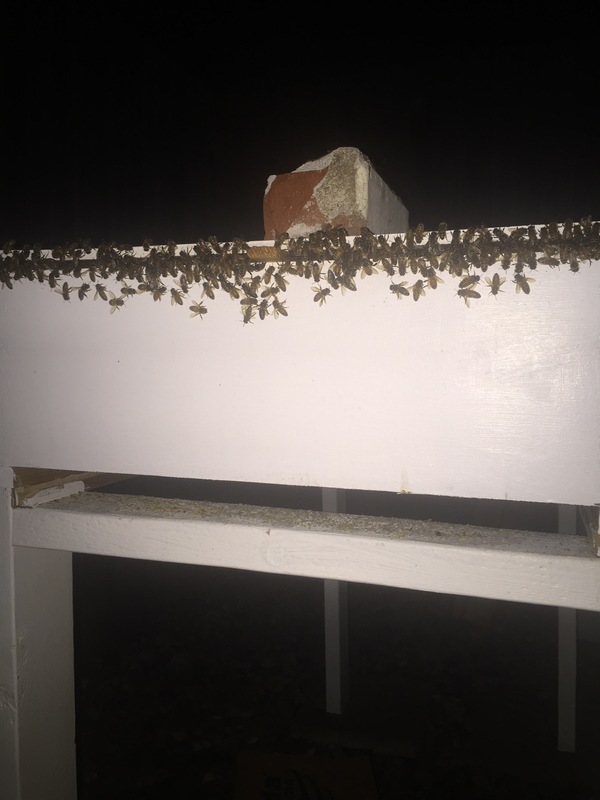 A week or so ago, I noticed bees hanging out around the hive entrance at night. Given that it wasn’t a particularly warm night (though, it had been about 85° F during the day), it didn’t seem like they should really be bearding. I ended up taking off the bottom cover of the hive to give them some ventilation. They seem comfortable with it. The last couple of nights, though, they’ve been back at the entrance after dark. I think this is a combination of hot days and new bees emerging (I am so excited, btw). I had already watched a couple of videos on processing comb into wax, and clearly did not have enough comb to melt it through a pillowcase for filtering (it would all have just soaked into the pillowcase). Instead, I tossed it into a small disposable baking tin with some water and set it on the stove. It melted easily enough, but all the schmutz (pollen and some leaves) was still in there, so I ran it all through a coffee filter. Some wax stuck to the filter, but conveniently, wax does not seem to stick to wet paper, so I was able to pull it right off. Anyhow, after filtering it, I was left with a nice little block of beeswax (about 25ml worth). I found a recipe online for a beeswax wood polish, which was just four parts oil to one part beeswax, by volume. The author of the recipe used jojoba oil, but I didn’t have quite enough jojoba, so I used a combination of jojoba and sweet almond oil. I measured out four parts oil and one part beeswax (I used water displacement in a measuring cup to find the volume of the wax), and put it all in a jar, which I then set in a pan of water on the stove. After a few minutes, it started to melt, and after about 10, the wax was completely melted. 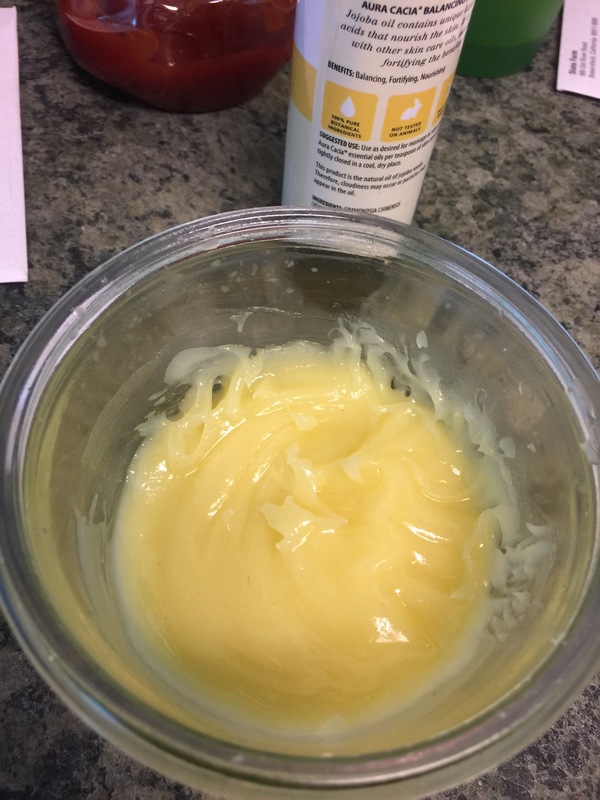 The recipe warned that you need to stir the cooling mixture every so often to keep it all mixed properly (apparently, the wax and oil separate if you don’t), so I stirred it well every 15-20 minutes, and finally ended up with a nice creamy beeswax/oil paste. I also added a few drops of lemongrass oil for smell. I applied some to a small wooden cutting board that has been needing oiling for a long time, and it looks fantastic. Darkened up the wood and water now beads right off of it. Success! I’m considering rubbing some on my Clark’s Desert Boots (though, I should really get them resoled first). And basically everything else I can find.